My best friend actually convinced me of this Jessica from Roger Rabbit Costume or I would have never had the nerve to actually do this. 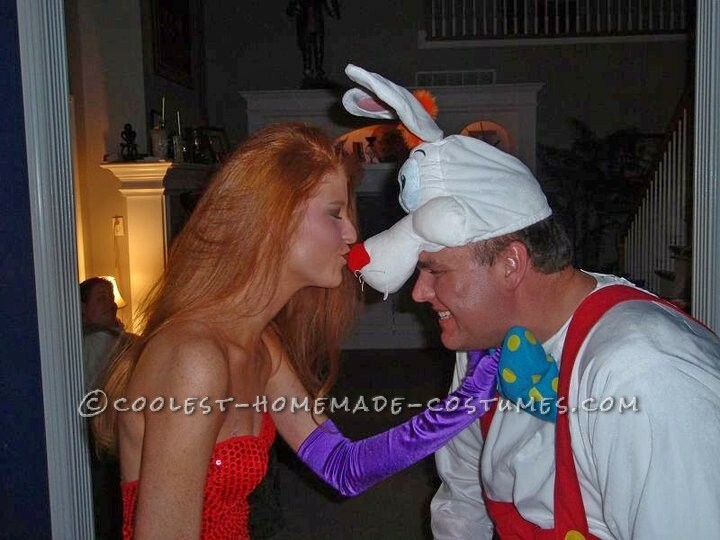 He purchased partials of the Roger and Jessica Rabbit costume and when I learned that he had done it, I couldn’t back out. He had the red dress. I had to handle the rest, though it wasn’t too much of a stretch. My hair is already long and bright red so some hot rollers to create the “Veronica Lake” hairstyle rocked by Jessica wasn’t to difficult (loose curls and bring a bit around to cover one eye… and leave the rest in back lightly curled). The makeup wasn’t difficult, I YouTubed a tutorial for Jessica Rabbit makeup (basically a bright purple cat-eye) and bright lips. For costume accessories I purchased purple satin Opera Gloves, and a huge tacky diamond ring for Roger to give me. I also tucked a small toy gun into a red garter (a nod to the movie) and partnered the whole thing off with a pair of 4″ stilettos that made my heart sing. Needless to say it was a great Halloween until trick-or-treaters asked who we were. It was then we realized how old we had become for today’s kids not to remember “Who Framed Roger Rabbit.” Good times!